The relation between meteorological quantities and the energy and mass balance of a glacier surface is a critical element in modelling the reaction of a glacier to climate change. 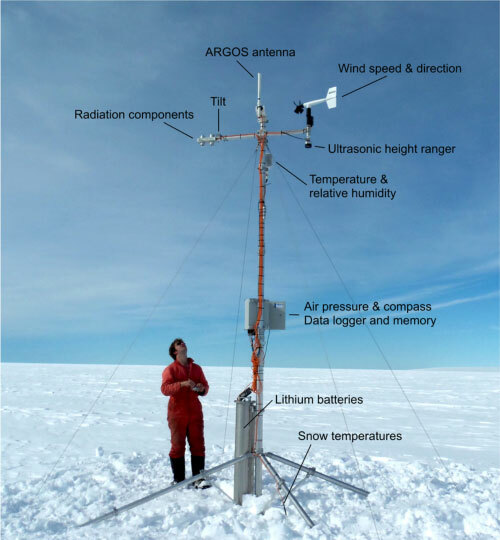 To get a better hold on the processes that determine this interaction, the Institute for Marine and Atmospheric Research, Utrecht University (UU/IMAU), has deployed several automatic weather stations (AWS) on glaciers, ice caps and ice sheets, since 1994. These AWS are deployed on different glaciers around the world, in different climate regimes. The stations are designed to work for long periods without being serviced and offer the opportunity to measure meteorological variables in remote areas and in harsh weather conditions. We are very grateful to all people and institutes who help and helped maintaining our weather stations all over the world. Without their help, financial or practical, the AWS would not have worked as well as they have. Financial support was provided in several different projects and by several different organizations. For more information, questions or data requests please contact us using the email address below. When requesting data, please add a small description of the project for which the data will be used. Note also that, when the data are used in peer-reviewed publications we ask for the opportunity to read the manuscript before submission to ensure proper acknowledgements towards our funding agency. The most recent development in AWS design is the iWS. All operational stations can be followed live on this site. The plots are refreshed every few hours and provide an overview of the measured parameters of the most current year and week. Data is available on request (see contact information). IASC Workshop on the use of automated measuring systems on glaciers , 23-26 March 2011, Pontresina, Switzerland. Workshop on the use of Automatic Weather Stations on Glaciers, 28-31 March 2004, Pontresina, Switzerland. UU/IMAU activities in the International Polar Year 2007-2009.